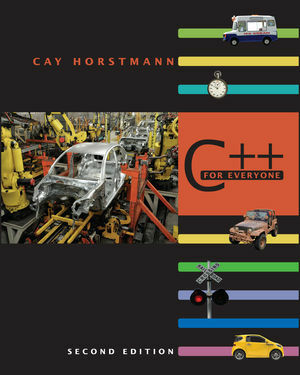 This exciting new edition by respected author Cay Horstmann provides an introduction to C++ and computer programming that focuses on the essentials ? and on effective learning. Suitable for a ﬁrst course in programming for students in computer science, engineering, technology, and the physical sciences, it requires no prior programming experience. The new edition provides even more tools for motivating students to program and giving them the tools to succeed. CAY S. HORSTMANN is Professor of Computer Science in the Department of Computer Science at San Jose State University. He is an experienced professional programmer and was Vice President and Chief Technology Officer for Preview Systems, Inc. He is also a consultant for major corporations, universities, and organizations on Java, C++, Windows, and Internet programming. Horstmann is the author of many successful professional and academic books, including Big C++, Java For Everyone, Big Java, Java Concepts, Object Oriented Design and Patterns (all with John Wiley & Sons, Inc.), and Core Java (Sun Microsystems Press), with Gary Cornell. Chapter 2 Fundamental Data Types. Chapter 6 Arrays and Vectors. The Following Chapters are Available Online Only. Chapter 12 Sorting and Searching. Chapter 13 Lists, Stacks, and Queues. Chapter 14 Sets, Maps, and Priority Queues. New sections on problem solving strategies provide techniques for planning and evaluating solutions—before starting to code. These include the use of pseudocode for algorithm design and pseudocode, hand-tracing code segments, using storyboards, and more. Optional engineering problem sets engage students with problems from engineering-related domains. More opportunities for students to practice what they have learned. A visual approach motivates the reader and eases navigation. Abundant illustrations and photographs make concepts memorable. Syntax boxes annotate code examples to present a visual summary of key points. Guidance and worked examples help students succeed. Step-by-step "how-to" boxes guide students through the implementation of core concepts. Worked examples on the web apply these steps to new problems. Tips and Common Errors Guide students to good practice. Practice makes perfect. Abundant practice tools build student confidence and skills. Self checks in each section test understanding and point students to exercises they can do to practice what they've learned. Teaches computer science principles, not just C++ or object-orientation. The core of the book builds students' skills in control flow, loops, functions, arrays, pointers and streams before addressing classes and inheritance. Focuses on the essentials while being technically accurate. The essentials are presented in digestible chunks, with separate notes that go deeper into good practices or language features.